Even fictional people have to eat. 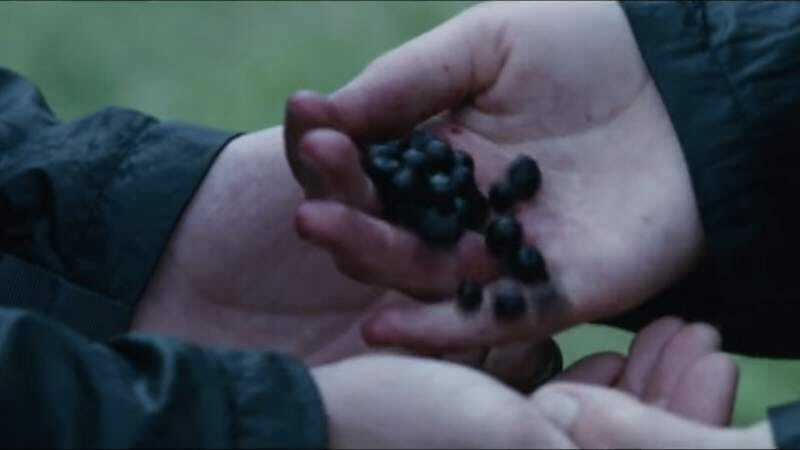 Sometimes food reveals what we should know about a character, sometimes it’s a pleasant pause in the action, and sometimes—(slaps berries from hand)… That’s nightlock! You’d be dead in a minute! Food Fiction is an ongoing feature that looks at some of the most memorable foods in the history of storytelling. There has always been food that came (often too late) with a warning. There is almost always a clear warning when we’re not supposed to be eating something. The title gag to the Whitney Darrow, Jr., collection “Stop, Miss!” has all the attributes of the best New Yorker cartoons: two tropes colliding; a catchy caption; and a one, two, three count as you complete the joke yourself. The actual humor is simple enough, but still requires that you do some of the lifting, which helps it stick with you, as it slowly dissolves into tangential rumination. What if someone had caught Eve and changed the course of biblical history, preventing eons of knowledge and regret? Or in an alternate universe, what would we do with a second chance at paradise, living among people with antennae, trying not to reveal to them what we know? Is the astronaut aware that his presence—complete with a technology-packed rocket—is as bad as the apple, or is his protest simply a gut reaction? Is God going around inventing worlds and administering this same test over and over, waiting for someone to pass? Would He be okay with His name taken in vain in this particular instance? More urgently: Will she listen? Will she eat it? What’s going to happen? We know what happens in the original. It’s one of the stories from which every other story descends, tales of downfall, temptation, and suspense as well as humorous-if-clichéd gags about husbands and wives. To hear King James tell it: “And when the woman saw that the tree was good for food, and that it was pleasant to the eyes, and a tree to be desired to make one wise, she took of the fruit thereof, and did eat, and gave also unto her husband with her; and he did eat.” If you focus on the family dynamic, Man’s fall from grace is sitcom-like. Some latter-day Adams and Eves are obvious: Maude would have Walter eating the apple without even being encouraged by the snake. Dan Conner would totally eat the apple if it would keep Roseanne quiet. Phil Dunphy, Homer Simpson, Bob Hartley, Bob Belcher, Ray Barone, George Jefferson, Cliff Huxtable, Al Bundy, Marshall Eriksen, Mike Biggs: They’re Adams, every one, in their way. They’d all bite. Of course, it’s not a comedy. The story of Eve, the Serpent, and the fruit of the Tree Of Knowledge is just the first in a long line of melodramas where the suspense builds as we wonder whether a character will eat something we know they shouldn’t—or, at least, we wonder when the character will eat the poison, because that’s how plots advance. Did anyone wander into one of those 2012 remakes of Snow White wondering if she’d eat the apple in the new versions? In the Disney version, the Nine Old Men animators taunt us as the innocent hesitates before eating the apple. In Snow White And The Huntsman they don’t even bother milking the will-she/won’t-she all that much. They know that we know she will. And we always know a lot more than the doomed eater—we’re all perfectly aware we’ve been cast out of the garden. The eater believes everything that looks edible is fine. A character in the presence of a dangerous substance is always in trouble without a tip off, or an instinct, or good fortune, or a dead monkey noticed by a quick-witted friend. Beyond the thrill of wondering just when and how the poison is going to be consumed, and by whom, and to what end, it’s also fun to learn the details of various poisons, and how they work. Agatha Christie loved poison, writing, “…it has not the crudeness of the revolver bullet or the blunt instrument.” And of course, she would know, being required to murder at least one person per book. More than any other major mystery writer, Christie turned to poison and had an ongoing interest in nefarious pharmacy (most often choosing cyanide to do the trick). Her notebooks are full of scraps such as “Possibilities of poison… cyanide in strawberry… coniine—in capsule?” or “Nitro-benzene—point is—it sinks to bottom of glass—woman takes sip from it—then gives it to husband.” Quite delightful. It’s fun to watch Walter White explain ricin. It’s fun to watch Peter Graves learn about food poisoning, as explained by Leslie Nielsen in Airplane! And it’s fun to watch Steve Martin’s Socrates realize what hemlock actually is. But then comes the vomiting, and the misery, and the fuss from the men trying to save her life amid a comedy of manners and authentic sadness. As Gustave Flaubert has done throughout his book, he insists on adhering to reality, and not Emma’s fantasy, and describing what it’s really like to die from arsenic poisoning: “Her chest soon began heaving rapidly; the whole of her tongue protruded from her mouth; her eyes rolled, grew paler, like the two globes of a lamp that is going out, so that one might have thought her already dead but for the fearful laboring of her ribs, shaken by violent breathing, as if the soul were struggling to free itself.” Poor Emma. Poor, dissatisfied, bourgeois Emma. She really didn’t think it through. She didn’t conceive how bad it would be. She knew she wasn’t supposed to eat that stuff but figured it was “but a little thing” and was focused on how it would play, on how it would create her best possible exit from dire circumstances with a little dramatic flair. She hadn’t counted on reality. Nor did impulsive Violet Beauregarde take reality into account. The gum-smacking second victim of that beloved child endangerer Willy Wonka, she was warned that Wonka’s three-course-dinner invention wasn’t safe, if perhaps a little coyly in the Gene Wilder version and shyly in the later Johnny Depp interpretation. But, like Emma Bovary, Violet Beauregard was not given to cautious assessment of reality, and she totally underestimated what was really going to happen to her. Though it must be said: Wonka is the worst about inadequate warnings. Knowing exactly what’s going to happen to you when you eat poison, and choosing to eat it anyway—or threaten to—takes an informed, desperate heroine. In The Hunger Games, which is essentially Willy Wonka meets Hatchet, we have the presence of poison established and deployed with the red-herring deftness of Agatha Christie, so that we’re completely aware of its existence and effects, but we’ve forgotten it by the time Katniss uses it to win the game. It’s one of the neatest little poison plot twists you can name—a simple power play, and another example of how this series manages to get us wrapped up with a questionable combination of sick horror and adventure-movie thrall at the predicaments of these attractive kids. It’s the perfect device for a story that’s all about who gets to eat, how much, and what (and shows Emma Bovary how to use suicide-by-poison to exert power in a society where the odds are against you). In the end, everything can work out okay—as long as you know for sure what you’re actually eating.